For other uses, see Vixen (disambiguation). Vixen is a comic book character and Superhero created by Gerry Conway and Bob Oksner. She first appeared in Action Comics #521 (July 1981), published by DC Comics. Vixen is a superheroine in possession of the Tantu Totem, which allows her to harness the spirit (ashe) of animals. She can conjure the power and abilities of any animal past or present. Mari McCabe – Cover art of Justice League of America: Vixen #1 (January 2017). Two versions of the character appear in The CW's Arrowverse. 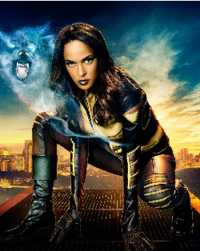 Original comic book character Mari McCabe debuts in the CW Seed animated series Vixen, voiced by Megalyn Echikunwoke, who also reprised her role in an episode of the live-action parent series, Arrow. Legends of Tomorrow introduces a World War II-era Vixen, Amaya Jiwe, identified as Mari's grandmother, portrayed by Maisie Richardson-Sellers. Vixen was intended to be the first African female DC superhero to star in her own series, but the first issue of her series was cancelled in the DC Implosion in 1978, never to be released. The story was subsequently printed in Cancelled Comic Cavalcade. Since her debut in Action Comics, she has primarily appeared in team books, most notably various incarnations of the Justice League and Suicide Squad. In October 2008, G. Willow Wilson began a five-issue limited series, Vixen: Return of the Lion. In ancient Ghana, the warrior Tantu asked Anansi the Spider to create a totem that would give the wearer all of the powers of the animal kingdom, only if they would use the power to protect the innocent. Tantu used the totem to become Africa's first legendary hero. The totem was later passed down to Tantu's descendants until it reached the McCabes. Growing up in a small village in the fictional nation of Zambesi, M'Changa province, Mari Jiwe McCabe heard the legend of the "Tantu Totem" from her mother. Sometime later, Mari's mother was killed by poachers and she was raised by her father Reverend Richard Jiwe, the village priest. Reverend Jiwe himself was killed by his half-brother (Mari's uncle) General Maksai. Maksai wanted the Tantu Totem, which Jiwe had possessed. 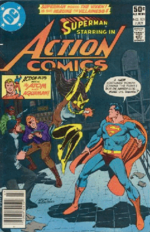 Vixen debuts in Action Comics #521. Mari ultimately moved to America, where she established an identity as Mari McCabe and got a job as a model in New York City. She used her newfound wealth to travel the world. On a trip back to Africa, she came across her uncle and took back the Tantu Totem, using its power to become the costumed superhero Vixen. Vixen made only two appearances as a solo crime fighter: once fighting poachers in India and once fighting against the techno-psycho criminal Admiral Cerebrus. She was a reluctant hero until the Justice League of America was reorganized by Aquaman. She applied for full-time League membership and was accepted. During her time with the JLA, the totem was taken from her by General Maksai, who still sought its power. The totem would only grant its full power to those who would use it to protect the innocent, and it caused Maksai to be transformed into a raging beast. Maksai died in battle with Vixen. When the team faced the killer android Amazo, Vixen and several of her teammates were beaten into unconsciousness and then left bound and gagged in a walled-off pit. Vixen saved the lives of herself and her fellow Leaguers by using her powers to shatter her bonds and dig to freedom. Vixen continued with that particular incarnation of the JLA until two members were killed, Steel and Vibe, and it was disbanded by the Martian Manhunter. Around this time, Vixen teamed up with Animal Man. She traveled to his suburban house with knowledge of a mysterious, murderous force that was affecting Animal Man's powers. He found himself unable to access his powers correctly. Vixen returned to modeling, but a Caribbean photo session turned violent; Mari's colleagues were killed by drug smugglers. She appealed to the government, who turned the matter over to the Suicide Squad. She went undercover to capture the drug kingpin Cujo, whose appearance had been revealed by footage from the photo shoot. Along with Captain Boomerang and Black Orchid, she destroyed the operation, but not before she lost control and killed the criminal kingpin. Revolted by what she had become, she agreed to work with the Squad until her animal instincts could be curbed. She worked with the Squad for some time, again seeing more teammates and friends killed. When it was disbanded for a year, Mari returned to modeling and even launched a successful line of clothing. Her failed romance with Ben Turner (the Bronze Tiger) made Vixen decline an offer to rejoin the Squad. She realized that Turner needed mental support, and she reluctantly returned. She ultimately gave up on a future with the Tiger, sensing that he would never admit to needing help, and left the team. After the Suicide Squad's heyday, Mari continued to do undercover work. She was drafted for at least one mission for Checkmate (the Squad's brother organization). At some point, she assisted Oracle and the Birds of Prey. She went undercover to investigate a strange "superhero" cult, where the leader was using mind control and wound up brainwashed by him herself. The Huntress tried to help her and was nearly killed. Vixen regained her senses by channeling the stubbornness of a mule to hold back the mind control of the cult leader. She and Huntress then rescued the other brainwashed heroes. Vixen may still have had trouble controlling her animal side while using the totem, as witnessed when she worked alongside the Flash to stop Gorilla Grodd. She also served on one mission with the Justice League Task Force, came to Wonder Woman's aid during a battle with Circe, and helped her former JLA comrades protect Lex Luthor. She then joined the loose-knit Ultramarine Corps. While part of the Corps, Mari was brainwashed by Gorilla Grodd who sent her and other heroes to battle the JLA. Ultimately, Vixen and the others were freed. After the murder of Sue Dibny in the Identity Crisis miniseries, Vixen rejoined her Justice League colleagues. She was present when the original Firestorm died during a battle with the Shadow Thief. Vixen adopted a new uniform in Infinite Crisis #7, similar to the one worn by her television counterpart on Justice League Unlimited. Vixen was tricked into battle in Hub City by a currently intelligent Solomon Grundy (whose rebirth came with increased intelligence). The totem was essential to Grundy's plans; he intended to use it as a catalyst to merge his perpetually reincarnating soul with the shell of the Amazo android, and thus gain further power. Grundy used the totem to increase the metahuman mimicking abilities of Amazo. Without her totem, Vixen found that her innate connection to the "Red", the 'essence' of animal life', was falling apart. She managed to 'lock onto' the totem, but her mind became lost in a flock of migrating birds. After mimicking the abilities of a young boy, Vixen managed to regain her mind and quickly flew to New York to retrieve her totem. Vixen literally dropped into the JLA battle against Amazo. After the villains were subdued, Vixen became a charter member of the newly revamped Justice League of America. Vixen's main story arc in the early issues of Justice League of America Vol. 2, centered around a change in her powers; Vixen changed from no longer drawing on animal characteristics, but to drawing on the powers of those around her. She matched others' skill levels and, as she suspected, drained powers from them. Superman was first to catch on to this and she subsequently revealed it to Red Arrow. Vixen sought out her former Suicide Squad teammate Bronze Tiger to discuss her situation, and subsequently admitted everything to the League. Chairperson Black Canary instructed her to hand in her credentials and removed her from the team. Afterward, Dinah discussed with Mari the possibility of fixing the properties of the totem with the assistance of Zatanna. When Zatanna attempted to find the source of the problem, she saw a mystic image of Vixen and Animal Man as puppets. When she tried to break the spell, she was repelled by an unknown force. When Vixen attempted to defeat the newly restored Amazo by absorbing all his stolen powers, she became mysteriously weak. She then fell unconscious, with Amazo bearing down on her. When Zatanna and Red Tornado finally resolved the crisis, Vixen went to seek Animal Man, since he had been affected by similar power fluctuations, and was left unable to tap into the powers of Earth-borne animals. There, they were both sucked into the Tantu Totem, where, like in Zatanna's vision, they were trapped in Anansi's net. Anansi, the Trickster God of African folklore, revealed his powers and how being the King of the Stories, he changed Buddy and Mari's personal histories and sources of powers to test them. In an attempt to keep them contained, Anansi restored their connection to the Red, but altered the personal histories of the Leaguers, to prevent them from ever founding the JLA. However, Vixen escaped and sought the new Leaguers to fight Anansi at their side. Although she succeeded in gathering allies, they were still no match for Anansi's power. Vixen held a gun to her totem, even though she knew that if the totem was destroyed, they would all be destroyed. This forced Anansi to return things to normal. Anansi then revealed to Mari that the whole thing was actually a test. He explained that reality had been changed on a fundamental level, and he needed someone to act as his agent against an individual who could take advantage of the situation. He restored Mari's powers, returned her and the JLA to their homes, and said that he would one day call upon her. Vixen: Return of the Lion is a limited series detailing Vixen's return to her home village for the first time. In that series, Vixen found that a local warlord named Aku Kwesi and his men had taken over several Zambesi villages. It turned out that this was the same man who killed Vixen's mother years ago. When Vixen confronted him, she found that he had powers that rivaled, and possibly surpassed, hers. These powers were based on advanced technology and chemicals that were given to him by Intergang lieutenant Whisper A'Daire. The rest of the Justice League of America went to Africa to render assistance, only to have several members get doused with Kwesi's specially prepared Vodun zombie potion. This allowed A'daire to take control of Superman and Black Canary and pit them against the rest of the League. During the Final Crisis crossover event, Vixen was at the funeral of Martian Manhunter, and later at the Hall of Justice when Empress, Sparx, and Más y Menos came there seeking help after being attacked by Mirror Master and Arthur Light. She later participated in a massive battle with Darkseid's forces after he nearly conquered Earth with the Anti-Life Equation. In the aftermath of Final Crisis, the JLA was in tatters, with many of its members having to leave. Mari and the remaining team members enlisted the aid of Hardware after Kimiyo Hoshi went missing in her search for Shadow Thief and Starbreaker. With help from Superman's friend Icon, the team emerged victorious in the battle with Starbreaker, with Mari having bright hopes for the future of the team. A short while later, Vixen broke her leg in a battle between the JLA and the dangerous villain Prometheus with Hawkman's mace. While she and the rest of the team tried to recover, they were ambushed by Despero, who sought to destroy the weakened League. The JLA eventually defeated Despero, only to be informed by Zatanna of the horrific events of Blackest Night taking effect across the globe. After the Black Lanterns attacked, Vixen told Kimiyo that she was taking a leave of absence from the team in order to recover from her injuries. According to writer James Robinson, Vixen was initially intended to have a significantly different exit from the team. According to him, issue #41 of Justice League of America was supposed to have Mari returning to Africa in order to help defend the continent in the wake of Freedom Beast's murder in Cry for Justice, eventually establishing a team of African superheroes known as the Justice League of Africa. Despite no longer working with the League, Vixen was one of the heroes hunting down Maxwell Lord at the start of Justice League: Generation Lost, and was presumably mind-wiped by him along with most of the Earth's population. She and Black Canary later traveled to San Francisco in order to help Zatanna capture a group of humans who had been transformed into Were-Hyenas. Sometime after her resignation from the JLA, Vixen traveled to the rundown neighborhood of Liberty Hill in order to recruit Tattooed Man for a new team of heroes she is putting together. However, Vixen discovered that a group of gang bangers who had formerly worked under Tattooed Man had taken control of the community and made a fortune for themselves through crime. Mistakenly believing that Tattooed Man was responsible for the acts of violence committed by his former thugs, Vixen rescinded her offer and attacked him. After a brutal fight, Vixen willingly surrendered and agreed to leave and let Tattooed Man take care of his neighborhood in his own way. In The New 52 (a 2011 reboot of the DC Comics universe), Vixen was recruited as part of the new Justice League International. Her tenure with the team proved short, since she was injured in an explosion and rendered comatose. Her old friend David Zavimbe later joined the team in her honor as Batwing. After the JLI disbanded, Vixen was seen as one of Cyborg's new recruits for the main Justice League roster. Vixen is recruited by Batman to join his new Justice League of America. Vixen possesses the innate ability to make direct contact with the Earth's morphogenetic field, which is sometimes known as the "Red". This contact with the "Red" allows her to draw upon the abilities of any animal that has ever lived on the planet. By simply focusing on a specific animal, she can draw its talent directly from the morphogenetic field and mimic its abilities, thus giving herself a variety of superhuman powers. Vixen's connection to the "Red" is so deep that she can use the abilities of multiple animals, once holding onto the morphogenetic traits of an entire forest. Her abilities have allowed her to channel the powers of extinct animals (such as the saber-toothed tiger and the Triceratops), domesticated animals (like the Doberman Pinscher), and even mystical beasts (like dragons). Her powers even allow her to twist some animal abilities, like when she used the bio-luminescence of a Marine hatchet fish and an Angler fish to produce light from her hand and to create a laser-like beam from her head. Recently, Vixen used the regenerative abilities of flatworms to reconstruct her entire body after she was killed during an explosion. Vixen wears a mystic artifact called the Tantu Totem, a fox-head shaped talisman given to her ancestors by the African trickster god Anansi. It was previously thought that the totem was the source of her powers but later stories, have shown that it merely prevents the morphogenetic field from overwhelming her mind. It was once assumed that the totem increased her range for mimicking animals as she has been seen taking on the traits of animals from across the world. However, this limit has been removed since The New 52. The full capability of the totem is unknown but Vixen once used the magic of the totem to heal bruises and wounds within seconds by simply touching it. The totem is, thus far, absent from her uniform and she has been seen taking on the traits of animals that were not within her vicinity. Vixen's claws/nails are particularly sharp and tough, enabling her to rend through a variety of substances, such as fabric, wood, cinder block and even soft metals with ease. Her claws are magically enhanced and have drawn blood from individuals who are considered highly resistant to damage or near invulnerable like Geo-Force, Despero, and Pre-Crisis Superman. Occasionally, she has been known to physically transform into animals—for example, she has shapeshifted into a gray wolf, a great horned owl, and a cougar. Vixen can also assume a hybrid form, in which she maintains a humanoid form but with certain animal adaptations, like when she took on the gills, fins, and missing eyes of a blind cavefish in JSA Classified and later shape-shifted into a humanoid wolf (retaining the cave fish's blindness). While the full extent of Vixen's control over the morphogenetic field is unknown, she has on occasions drawn pure energy from it and displayed this energy as a force field and energy claws. While in cooperation with Animal Man and the woman known as "Tristess", she helped to create an entire universe. Vixen also has the ability to communicate with animals and can override the natural predator/prey instinct found in most wild animals. One apparent drawback of Vixen's powers is that she is not always able to control the inputs from the morphogenetic field. Sometimes, she has absorbed unwanted animal behavior, such as instinctive rage or killing frenzy. The longer she stays in contact with the morphogenetic field, the less human and more animal she seems to become. It is unknown what would happen if Vixen tried to use her magical abilities on an alien animal, or if she would gain access to the morphogenetic field of another planet. While assisting Hawkgirl during a mission on a distant planet, she was able to access her abilities. During the time when Vixen was mimicking human abilities, she was able to mimic the extraterrestrial abilities of Superman. This might indicate that she is able to mimic the abilities of aliens as long as she is aware of them. After losing the totem, Vixen is forced to tap into the human template as a way to purge herself of pure animalistic sensations and regain her humanity. Afterwards, Vixen is briefly left by the god Anansi with a crippled connection with the morphogenetic field, unable to reach any animal except the human animal. In this state she shows the ability to mimic metahuman powers, such as Jay Garrick's speed, Geo-Force's earth-based powers, and Black Lightning's elemental control, as well as the Kryptonian superpowers of Superman, an extraterrestrial. Her abilities are not only limited to that of metahumans, as she was able to duplicate Red Arrow's archery skills and even Green Lantern's ring in an issue of Justice League of America, suggesting that she has gained powers similar to those of Amazo. It is revealed that this is actually trickery on the part of Anansi. Upon confronting him within the Tantu Totem, Vixen learns the truth about her powers: For unknown reasons, Anansi has made the Tantu Totem his current home. Vixen's family are custodians and guardians of the totem, which they have passed down through the generations. While Mari doesn't need to be wearing the totem to use her powers, she is expected to keep it safe for Anansi. Anansi restores Vixen's original animal powers, then, after testing her abilities as a hero, he states that she is his "champion". In the alternate timeline of the Flashpoint event, Vixen is a member of Wonder Woman's Furies and one of the former lovers of industrialist Oliver Queen. Vixen and Oliver have a daughter who tries to assassinate her father, but is killed by his security team. 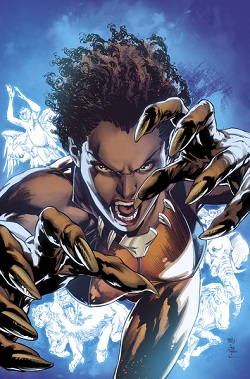 An alternate version of Vixen is shown as part of the Justice League of Earth-23, a world in which black superheroes hold prominence in the superhero community. Vixen appears in a flashback in an issue of Justice League Beyond, which is set in the DCAU. It is revealed that on the night John planned to propose to her, Mari was killed after being impaled through the stomach by Shadow Thief. In retaliation, John then kills Shadow Thief, resulting in John's expulsion from the Green Lantern Corps and his marriage to Hawkgirl. In the Injustice universe, Vixen works with Ra's Al Ghul, she is seen taking care of endangered species alongside Animal Man. In the DC Bombshells continuity set in World War II, she is a lesbian, and helps the Bombshells with her lover, Hawkgirl, who is a technological genius and archaeologist. Megalyn Echikunwoke as Mari McCabe from the animated web series in the live-action Arrow (left) and Maisie Richardson-Sellers as Amaya Jiwe in DC's Legends of Tomorrow (right). In January 2015, The CW announced that an animated web-series origin story centered on Vixen would be debuting on CW Seed in autumn 2015. It is set in the same universe of sibling The CW series Arrow and The Flash. The series is mainly set in Detroit, Michigan, with a few crossovers with the other Arrowverse shows; and if successful might lead to a live-action adaptation. Mari McCabe / Vixen is voiced by Megalyn Echikunwoke while Kimberly Brooks voiced Mari's younger counterpart. In 2016, Echikunwoke reprised her role as Mari McCabe / Vixen in the Arrow season four episode "Taken." It is revealed that Mari has become an experienced vigilante with extensive knowledge of mysticism. In the episode, Mari helps Oliver fight Damien Darhk, who has kidnapped Oliver’s estranged biological son, William Clayton. Echikunwoke has said there is potential for her to have a live-action spin-off series. Mari McCabe / Vixen also appeared in the second season of the Arrowverse animated series Freedom Fighters: The Ray on CW Seed. Amaya Jiwe appears as a series regular in the second and third seasons of Legends of Tomorrow, portrayed by Maisie Richardson-Sellers. Amaya, known as Vixen in the field, was recruited by the Justice Society of America to fight against Axis forces alongside leader Rex Tyler / Hourman, Commander Steel, Obsidian, Stargirl, and Doctor Mid-Nite. At some point, Amaya's enters into a relationship with Rex and when he is murdered, she joins the Legends to find his killer. Amaya is confirmed to be Mari McCabe's grandmother when Ray Palmer, who had previously worked with Mari, warns Nate Heywood about changing Mari's destiny by getting involved with Amaya. Despite defeating Rex's killer and gaining knowledge of her tragic destiny, Amaya decides not to alter time and remains with the Legends for the time being, while also pursuing her relationship with Nate. Season three makes further connections between Amaya and the web series with the introductions of new Legend, Zari Tomaz, and secondary antagonist, Kuasa. Zari, a vigilante from 2042, forms a bond with Amaya due to the former's possession of the air totem of Zambezi. Kuasa, who is Mari’s biological sister, enemy, and uneasy ally, has been revived by the season's main antagonist Mallus since her death in the Vixen web series, again in possession of the water totem. Ray, recalling his previous battle with the water-bending villain, confirms to Amaya that Kuasa is indeed her granddaughter. Amaya discovers that her future counterpart wiped her memories as the Legends to preserve Mari's destiny, and realizes that although Mari became a superhero, Kuasa's life was irreparably damaged. Amaya, with the help of her future daughter Esi, saves her village from being destroyed in 1992. The new timeline reflects these changes, with Mari and Kuasa sharing the Anansi Totem. At season's end, Amaya decides it's time to return to her village in 1942 with her knowledge of what she learned as a Legends remains in her memories. Vixen is mentioned in Black Lightning episode "The Book of Little Black Lies". Vixen has made numerous appearances on Justice League Unlimited, voiced by Gina Torres. Vixen's powers aren't given any explicit origin; she merely needs to touch the totem on her necklace to activate them. She is apparently able to fly and can use animal abilities without any proximity to the actual creature, and at one point does so while on a different planet. She is commonly shown mimicking an elephant to increase her mass by several tons or to hit much tougher opponents. While her appearance does not change, a ghostly image of the animal she is mimicking is projected from the totem on her necklace, and temporarily appears in front of her. Also, it is shown that her claws are particularly sharp as she is able to cling to a wall and easily slice through concrete and metal with them. Vixen first appeared on the episode "Wake the Dead." Her first scene was on the catwalk, and she was later revealed to be Green Lantern's girlfriend (addressing him repeatedly throughout the series as "Boo"), to the jealousy of his former lover Shayera Hol, who still harbored strong and perhaps requited feelings for him. When she and John face Solomon Grundy, she uses the strength of an elephant to temporarily down Grundy, but is unable to stop Grundy's onslaught. John and Vixen are unable to stop Grundy but she proves herself when she manages to save John while also pushing him back. Vixen was later featured in "Hunter's Moon," where she, along with Vigilante, came to terms with Shayera Hol's actions in the Thanagarian invasion of Earth. Despite their mutual affection for Stewart, they even established a friendship (more like a friendly rivalry) of sorts. In "Grudge Match," she and Shayera teamed up with Black Canary and Huntress in a forced (and unsuccessful) battle against the powerhouse Wonder Woman. As the series ended, John Stewart and Vixen were still a couple, with John stating that he would not be destiny's pawn, even though he met his own son with Shayera in the future. However, the durability of their relationship is called into question by the creators' post-show comments and the existence of a possible future son, Warhawk, between Shayera Hol and John Stewart. In her appearances, Vixen is seen using the strength of an elephant, the speed of a cheetah, the regeneration of a lizard, the color-vision of a salamander, the wall-crawling of a spider, the kick of a donkey, the constriction of an anaconda, and the electric shock of an electric eel. Vixen as she appears in Batman: The Brave and the Bold. Vixen appears in the Batman: The Brave and the Bold episode "Gorillas in Our Midst! ", voiced by Cree Summer. This incarnation of Vixen wears an outfit similar to her modern JLA costume, but with long black boots and gloves. Batman requests her help when Gorilla Grodd replaces the human population with gorillas. She appears to have a relationship with B'wana Beast. She helps B'wana Beast stop a jewelry store robbery by Killer Moth, using the kick of a kangaroo to knock him out. She later confronts B'wana Beast to talk about their relationship, but is cut off by Gorilla Grodd's invasion of Gotham. She uses a hawk's ability to fly to confront Grodd's aerial assault, but is netted by one of Monsieur Mallah's missiles. She's saved by B'wana Beast's snake/pigeon hybrid and soon escapes taking the charge of a rhino to plow through apes. Vixen is soon stopped by Gorilla Boss and knocked out by Gorilla Grodd's electrical gauntlet. Her Tantu totem is taken away by the gorillas and she and B'wana Beast are locked up in the Gotham Zoo, where B'wana Beast tells her she should just leave a "D-list" superhero and boyfriend like him and find someone better. They are soon joined by Batman and Detective Chimp, the latter beginning to hit on her before being combined with a bee by B'wana Beast's powers to help them escape, also helping regain her totem. She uses the agility and speed of a cheetah to fight Gorilla Boss, who captures her, but shocks him when he's distracted by B'wana Beast and his crocodile/ostrich hybrid with an electric eel's electricity. She later knocks out Gorilla Boss with the strength of an ant. In the end, Gorilla Grodd and his army are defeated, and Batman and Detective Chimp leave, allowing Vixen and B'wana Beast to talk about their relationship. B'wana Beast tells her he knows he's not the perfect man, but she cuts him off with a marriage proposal, which he gladly accepts. In "The Siege of Starro! ", Vixen is one of the many heroes taken under the control of Starro, and B'wana Beast desperately tries to save her. After she is freed from the Starro parasite's control, she notices B'wana's absence. After B'wana sacrifices himself to defeat Starro, she is seen grieving at his funeral. In Teen Titans Go! episode "You're Fired! ", Vixen is one of the animal-powered heroes auditioning to replace Beast Boy. Vixen appears in Justice League Action, voiced by Jasika Nicole. Vixen made an appearance in the DC Superhero Girls webseries, voiced again by Kimberly Brooks. In this version, Mari works as a volunteer at the Metropolis Zoo. An alternate version of Vixen named Vamp appears as a member of the Crime Syndicate of America in Justice League: Crisis on Two Earths. Unlike her counterpart, Vamp actually transforms into different kinds of animals rather than just taking on their traits. She was seen taking the form of a lion, a snake, and a bear. Her powers are somewhat similar to Beast Boy's powers, where she is brown in all her forms and has gold protrusions coming from her eyebrows. A notable fact about Vamp's shape-shifting abilities is that she takes on the form of a male lion (having the mane of one). She was defeated by Wonder Woman, who broke her back over her knee in bear form. In Batman and Harley Quinn, one of the waitresses in the restaurant Harley Quinn worked for a time makes a cameo, wearing an exotic version of Vixen's costume. Vixen appears in DC Universe Online. Vixen appears as a playable character in the portable version of Lego Batman 2: DC Super Heroes and pieces to assemble her are available in the console version. Vixen appears as a playable character via DLC in Lego Batman 3: Beyond Gotham. Vixen appears as a premier skin for Cheetah in Injustice 2, with Megalyn Echikunwoke reprising the role. Vixen appears as a playable character in Lego DC Super-Villains, voiced again by Megalyn Echikunwoke. ^ "WC10: Spotlight on James Robinson". Comic Book Resources. Retrieved 2011-01-30. ^ "DC Comics' Vixen Coming To CW Seed". KSiteTV. January 11, 2015. Retrieved January 11, 2015. ^ "The CW's Mark Pedowitz On Expanding Flash-Arrow Universe, 'Dixie's Future, Another 'Supernatural' Spinoff & More". Deadline Hollywood. January 11, 2015. Retrieved January 11, 2015. ^ "GUGGENHEIM TALKS "PUSHING THE ENVELOPE" IN "ARROW"/"FLASH" ANIMATED SPINOFF "VIXEN"". Comic Book Resources. January 12, 2015. Retrieved January 12, 2015. ^ Holbrook, Damian (December 18, 2015). "Exclusive: An Animated Vixen Comes to Life On Arrow". TV Insider. ^ Damore, Megan (February 24, 2016). ""ARROW'S" MEGALYN E.K. CALLS HER ROLE AS VIXEN A 'DREAM COME TRUE'". Comic book Resources. ^ Hogan, John (August 30, 2017). "CW Seed Offers A Ray of Hope with 'Freedom Fighters: The Ray'". TV Insider. Retrieved July 16, 2018. ^ CW Seed [@cwseed] (July 10, 2018). ". 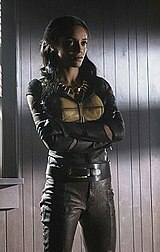 @Megalyn returns as Vixen in the next chapter of #TheRay, premiering July 19 on @cwseed" (Tweet). Retrieved July 16, 2018 – via Twitter. ^ Holbrook, Damian (June 7, 2016). "DC's Legends of Tomorrow Recruits Vixen... With a Twist!". TV Insider. Retrieved June 7, 2016. ^ Siegel, Lucas (June 23, 2016). "Maisie Richardson-Sellers is DC's Legends of Tomorrow's New Vixen". ComicBook.com. Retrieved June 24, 2016. ^ "1st Look: JUSTICE LEAGUE: CRISIS ON TWO EARTHS Clip". Newsarama. Retrieved 2011-01-30.